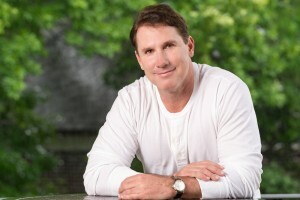 Here’s a novel idea: the worlds of words and music, chapter and verse – if you will – have converged between singer-songwriter JD Eicher and accomplished author Nicholas Sparks. 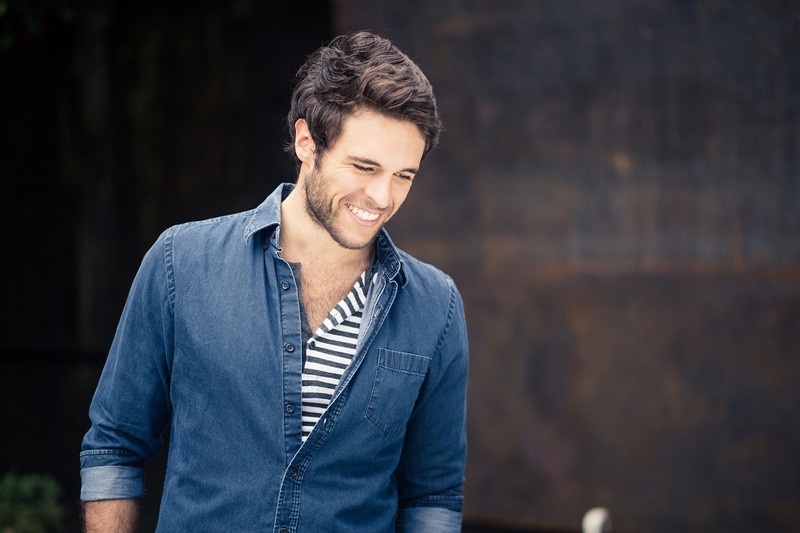 The Youngstown, OH born and bred Eicher has recorded an accompanying four-song EP for the Omaha, NE born and much-traveled Sparks’ latest book, Two by Two, available October 4. Eicher’s EP, also titled Two by Two, is available for free through December 6 at twobytwomusic.com. So, here’s another novel idea: I spoke with Eicher and Sparks separately, almost a week apart, and had in-depth and thought-provoking conversations on both occasions. With that as backdrop, what I’ll try to do in this Q&A is intersperse and intertwine portions of both conversations in an attempt to make it seem like the three of us were in the room together. Let’s call it a three by three chat about Two by Two. JD, it’s good to talk to you again. I know you’ve been busy since the last time we spoke, and that’s why we’re on the phone today. This is a very unique project I want to talk to you about. 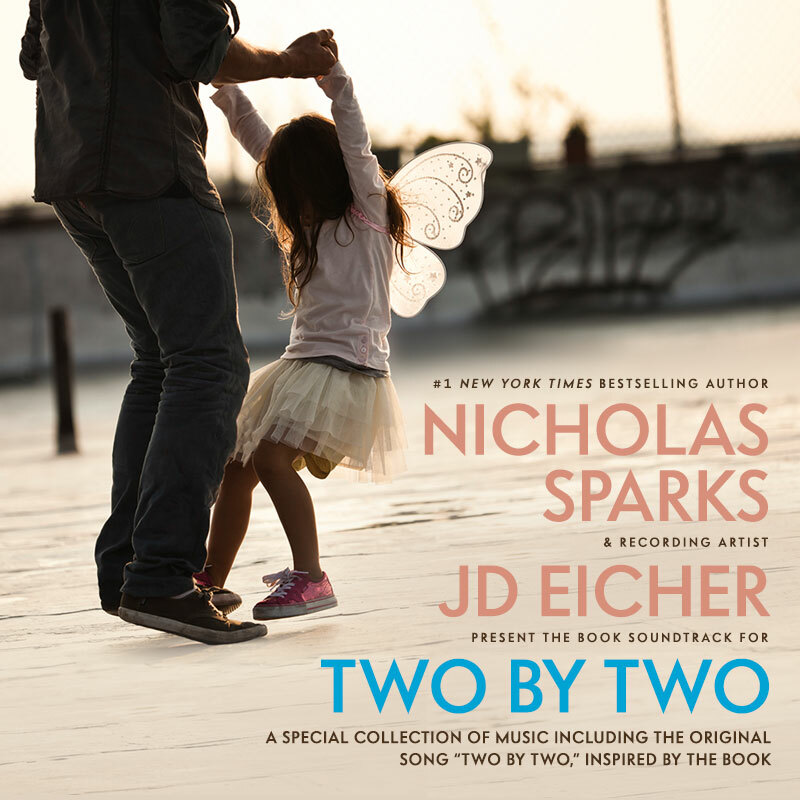 So everyone’s very familiar with soundtracks accompanying movies, but your new Two by Two EP sort of serves as the soundtrack for Nicholas Sparks’ new book Two by Two. Before we talk about the EP, give us a prologue, if you will, of how the two of you partnered on this project. JD Eicher – Well basically Nicholas and his team were looking for and on the hunt for music and for an artist to do this project – to do the soundtrack. Our record label Rock Ridge Music gets distributed through ADA – Alternative Distribution Alliance – and over at ADA there’s a gentleman named Jason Sprague who’s a big supporter of me and the band, and he did us a favor and tossed our name into the hat for consideration. And so, as they were looking through bands they stumbled upon us and decided to get in touch. That’s kinda how it began. Good morning, Nicholas. Thank you for your time. I know our time is brief so I’d like to jump right into the conversation with this: I found a quote of yours in which you said JD is a “master of complex emotion.” What do you mean by that? 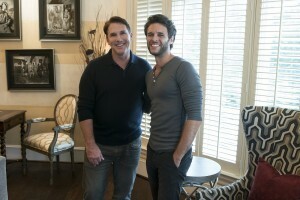 Nicholas Sparks – Well good morning, and thank you for your time as well. JD is a tremendously talented songwriter. Music, depending on the type of music that you’re looking for, it usually elevates one emotion or another. Whether it’s simply peacefulness or energy or anything along those lines. 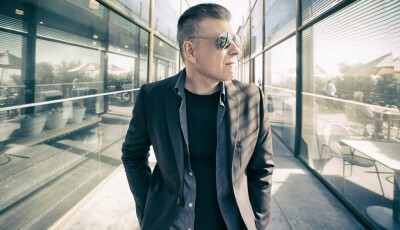 And if you listen to the four songs that he put on the accompanying EP, not only do I believe he captured the theme of the emotional movement in the novel in its entirety in Two by Two, but he caught different flavors of the emotions that I invoked in different areas of the novel, whether it be longing or struggle. And I just think that when you take those four songs together, it’s a wonderful way to enjoy the emotion of a story. The same type of emotions that I create in my stories. It’s just another way to enjoy those. I enjoy a film version; that’s a different medium. Song is a different medium, literature is a different medium, television’s a different medium. I try to write books that work readers through all of the emotions of life. When you go through these tracks of songs you really feel a lot of different things, and that to me is music that I tend to remember. Can you give us a brief synopsis of what your new book Two by Two is about? NS – Sure, it’s the story of a guy named Russ Green who’s been married for about 9 years and has a 5-year-old daughter named London, and through some choices and decisions that he makes regarding work – he actually decides to start his own business, which doesn’t go so well – his wife then goes back to work, and he’s thrust into the role of really becoming a father for the first time. So he provides his daughter full-time care because his wife is off at work. And of course, lots of other things happen, without giving too much away. 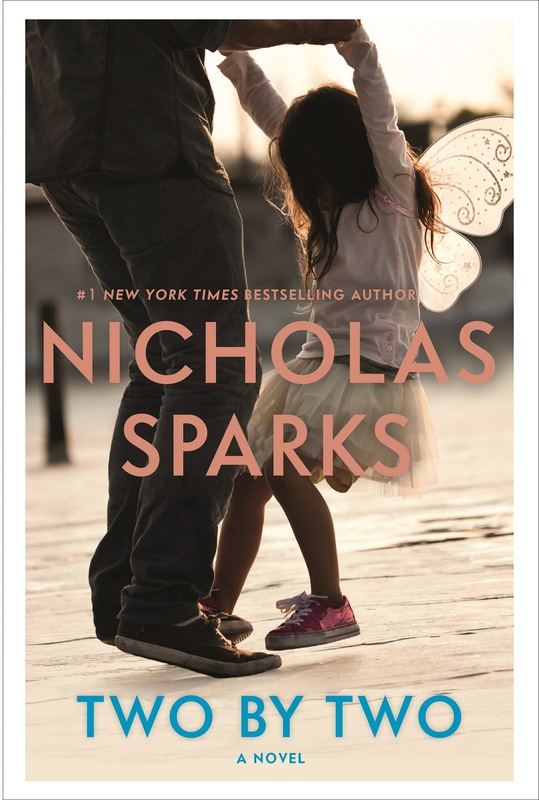 You can probably sum that up simply by looking at the cover of the novel, which is a picture of this guy dancing with his little girl. JD, what was it about the storyline that made you want to get involved? JD – Him figuring out how to be a father to his daughter during this tough time. That’s definitely the part that I held on to. The book was still being written while the soundtrack project got started up. I spoke with Nicholas over the phone and he gave me the rundown on the central themes, the plot, how it starts and ends. At some point he told me about the father-daughter element and asked me if this was something I thought I could be inspired to write about. It was such a perfect time in my own personal life because my wife and I had just found out that we were gonna have a baby girl, so I was about to be a father of a daughter, you know. It was just a serendipitous thing where it was the right moment, the right timing in my own life to match up. JD – A lot of pages (laughs)! (Laughs) Exactly! The first track on the four-song EP is the title track, and it’s obviously inspired by the book. Specifically, what aspect of this story sparked the writing of this song? JD – I think the main thing that sparked the writing was how they were both thrown into a difficult situation and how they’re kind of interdependent – they need one another – and how there’s a learning process between the two of them as they figure out how they’re gonna get through this conflict, and how they need each other to get through it. Even though he’s the dad and he’s supposed to be the caregiver, he’s also gaining strength from her, and that bond kind of pulls them through. Nicholas, I understand you have twin daughters. I have two grown daughters. How do explain the very special daddy-daughter dynamic? NS – Well I think it’s pretty clear and biological and psychological in that, when we’re talking about good fathers, one’s who aren’t abusive or anything like that, these are the first men the little girls love in their life. And they learn a lot about what love means and how ideally you’re supposed to treat a lady, or how you’re supposed to interact or the sacrifices that you make. So it’s the first guy that they ever love. Then of course that shifts sometime during the teenage years or in their 20s when dad falls to number two (laughs). That’s just the way it goes, and it’s supposed to be that way. I’d like to share a personal anecdote that as I writer I think you’ll appreciate. Just a few weeks ago I attended my 40th high school reunion and I’m still very much in contact with my journalism teacher Konnie Krislock, who I’m thrilled to say is a friend and a lifelong mentor. I asked her what one question she’d ask you, so in order to complete my “assignment,” here it is: what woman made the biggest difference in your life? NS – Oh boy, well you gotta go with mom. My mom just had really one of the effervescent, outgoing personalities, and of course she was also an English teacher. She was the one who helped me craft some of my early writing, and school writing, generally, and she read all the time, so she developed within me a love of reading. And what a wonderful way to develop the love of story as a young child. JD – I can’t really speak for why they chose it, but personally I can see how it could fit in the sense that that kind of talk speaks to frustration that maybe would apply to Russell’s own frustrations and struggles with his wife and their broken relationship. I can see how it could be frustration with past love that has failed, and that would tie in well with what sets Russell and London off on their own adventure in Two by Two. Got it. Thanks for that observation because it clarifies it more, and I see how that line works. As I mentioned, the closing song, “Not Afraid,” is also the closing song on your current album The Middle Distance. When we last spoke back in March of this year I told you my favorite song on the album was “Not Afraid.” I went back and checked my notes and listened back to the audio of our conversation (laughs). JD – (Laughs) Oh, okay, so the pressure’s on (laughs)! (Laughs) Needless to say I was very happy to see it on the EP, so I’d like to think I influenced the selection of this song for this project, which means I’ll only need two percent from all profits from the book, the EP, and the inevitable movie to follow (laughs)! I’m kidding of course, but seriously tell me the real reason why you, or they, chose to include that song. JD – Right, well they did, although I’ll tell you I’m probably happiest with that choice because there’s a line in that song that says “Take my hand, she said” and “hold each other up,” and so that actually kind of ties back. There’s a lyric about lifting each other up in “Two by Two;” the first track. By the end of the novel, Russell has kind of grown into something different, and I think it makes sense to close the EP with that song. Nicholas, nearly 20 years to the day after the release of your first book, The Notebook, you’re releasing your 20th book, Two by Two. What’s the common thread that ties these – and all your books together? NS – There’s a few common threads. One I think is there’re stories that people enjoy; we’ll start with that. And they’re stories that tend to evoke the whole range of human emotions. All of them are set in North Carolina. And most of them have at their core, love and loss in some way. So you live in North Carolina, and the book is set in Charlotte. Why did you choose Charlotte as the setting for this story? NS – Well it’s interesting; all my novels have been set in North Carolina, but what makes this novel entirely different than any other one that I’ve ever done is that it’s the first one set in a major city. The second largest city I’ve ever written about is Wilmington, North Carolina. Charlotte is the major city in North Carolina and for Two by Two I just really felt that this particular story needed the backdrop of a city as opposed to a small town, for a variety of structural and plot-driven reasons. So I chose to do that because quite frankly a lot of my readers live in cities as well. JD, you said of working with Nicholas on this unique collaboration: “I love the challenge of writing a song for a particular purpose, and diving into the Two by Two story and its themes was an inspiring and rewarding process.” Both of you are of course extremely gifted storytellers. What, if anything, did you learn from him that you can apply to your future songwriting? JD – Hmm, that’s a great question. I think it was cool to work with Nicholas because I learned through the collaboration that he did some very interesting things. When I talked to him about the music he told me, you’re the musician, I want you to do whatever feels good to you, and I want you to make this right for you, so you can sing it and believe it. So I learned right off the bat from him that idea that when you’re collaborating you have to allow space for the other person to really have their moment to find themselves in the work, which is a special thing. He offered me feedback and really wanted me to revisit some of the lyrics. The way he did it was like, I was kind of glad for it, because it helped me see what I could do to get closer to what he really wants. So I liked that he gave me feedback directly, and I also like that he kind of left it open for me to be me in a song, which is cool. He’s definitely a pro. Nicholas, same question for you. What, if anything, did you learn from JD’s songwriting that you can apply to your writing? NS – Oh, wow, that’s a good question. Brevity (laughs)! And I think that that’s important. If you look at my novels, this latest novel Two by Two is gosh almost three-times as long as The Notebook. Three times! Yet there will be readers who say that The Notebook perhaps was more effective at moving emotion. And so it was a wonderful reminder that if you do your job well – whether its song or literature – that brevity doesn’t mean not as good. It can be even more powerful. For instance, you could write in my world, boy London, England was an interesting place and the British Empire ruled the world, but at the same time there was a lot of poverty, there was no social services. You could go on and on and on for pages and pages. Or, you could say, “It was the best of times, it was the worst of times,” which is of course, brevity. Brevity in some ways can be even more powerful to evoke emotion. JD, let me wrap up with this final question for you: Nicholas Sparks aside, who is your favorite author and why? JD – Well, let’s see, that’s a good question. You know I’m gonna go with J.D. Salinger. I really like the book The Catcher in the Rye. Ah, cool. For the record, for me it’s John Steinbeck. JD – Yeah, cool. Of Mice and Men was one of those books that in school they made me read, but I didn’t mind that they made me read it. Bingo! That’s one of my all-time favorite books. So Nicholas, who is your favorite author, and why? NS – My favorite author? Easy: Stephen King! Not only did I grow up reading him – he was one of those novelists that I read as a child – but there’s an authenticity and honesty to his characters within the context of the story he’s writing, and he never loses sight of the fact that he’s trying to tell a story that readers will enjoy. 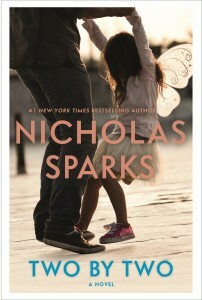 Again, Nicholas, I thank you very much for your time, and again the book comes out October 4. It’s been a pleasure. NS – Absolutely. Thank you for talking to me. Bye. JD, thank you. It’s been great to talk to you again. JD – Thanks, Jim. I appreciate you taking me on for this project, too. Hopefully we’ll have some other news and we’ll be able to talk again soon. That would be great. And again, congratulations on this EP. You’re working with a pretty talented guy. JD – Thanks. I’ve been pinching myself from the start with this whole thing. This came out of the blue and it feels like a miracle – at least personally – because this is a chance to reach more ears, so I’m very grateful. Okay, we’ll hopefully talk again soon. JD – Sounds good. Thanks, Jim.